Most people associate steel with building skyscrapers, hangars, and other large buildings. However, the truth is you can use steel frame construction to put together just about any structure, since steel holds numerous advantages over other building materials. Check out the benefits of steel frame construction below. It’ll allow you to build your structure quickly. Time is money in just about any industry, but it’s especially true in the construction industry. When you’re putting together a frame for a building, it has to be done as quickly as possible. 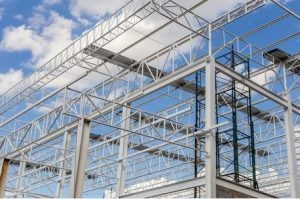 It’s easy to stick to a schedule with steel framing since steel parts can be pre-engineered at a factory and then put together quickly once they are on site. You won’t have any trouble hitting deadlines with steel frame construction. It’ll save you money in a variety of ways. You’ll get to enjoy all kinds of cost savings when you choose to use steel during a construction project. Innovations in the steel production process have made it more affordable today than ever before. Using steel over other building materials will also save you money on insurance premiums since insurance companies will appreciate you using such a durable material. Additionally, steel frames won’t need to be maintained, repaired, or replaced as frequently as other materials. All of these aspects of steel will equal more money in your pocket in both the short and long term. It’ll prove to be durable. Once you have a steel frame up and in place, you won’t need to worry about doing much else to it for a long, long time. Steel can stand up to almost any weather conditions, and it’s durable enough to withstand whatever gets thrown at it. This will give you a peace of mind you simply won’t get with other materials. Do you want to use steel for your next framing job? Contact R.G. Smith Company to take advantage of the steel services we can provide for you.